The Beatles Through The Years: Paul and Ringo - The Tour. Paul and Ringo - The Tour. 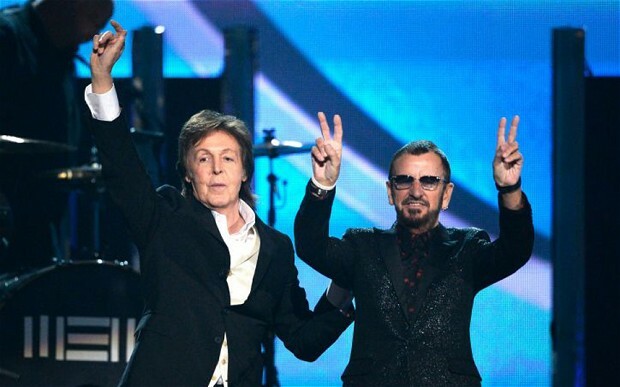 McCartney & Starkey in 2015. Sorry, I know it was a misleading title, half of you thought: "YES! PAUL AND RINGO TOURING! WHERE CAN I GET TICKETS?!" and the other half of you thought: "NO! PAUL AND RINGO TOURING! THIS IS A DISASTER!" No. Paul and Ringo are not touring together. Well, my personal belief is that while it would be fantastic to see them on tour together, (Their on stage banter would be solid gold alone) it would just make things extremely sad that John and George weren't there. This is why they don't do it. Not just because it wouldn't be the Beatles and wouldn't be the same but because their soul brothers aren't there. Their mates. It's just not right to go from city to city, country to country, without their physical and mental presence. They know that and, deep down, so do we. If John and George were still alive and all four of them said yes to a Beatles world tour in 2016, complete with songs spanning their whole career, the signature guitars Rickenbacker, Gretsch, Hofner and Epiphone making an appearance, John even breaking out the cripple routine for old times sake (Yeah, Twitter would LOVE that), even ending the show with the signature bow, it would be an absolute frenzy. I mean, bloody hell! Can you imagine the nightmare Ticketmaster would be?! People on their laptops and tablets at 10am sharp clamouring for tickets, the scalpers buying them all up and then there would be the actual concerts themselves. Every city would be in an uproar. Beatlemania would be reborn in a whole new explosive way. It would be fantastic and crazy again. Just like the 1960s were.